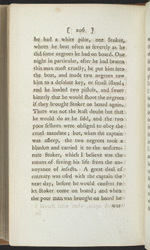 Extract from the autobiography of Olaudah Equiano. This extract includes Equiano's trip to the Caribbean with his friend and former employer Dr Charles Irving in order to set up a new plantation on the Caribbean coast of Central America. Equiano was appointed buyer and overseer of the slaves for the plantation. At this time the anti-slavery movement was not very advanced and there were relatively few abolitionists. Equiano, like many others, had the view that slaves should not be badly treated and that they should have decent living conditions. However, despite being an ex-slave himself, he clearly was not an abolitionist at this time. His experiences during this trip (? he was cheated of money and, to his horrror, there was an attempt to re-enslave him) caused Equiano to resign and to return to London. It was during this period that he became increasingly concerned with social and spiritual reform ? and with helping his fellow Africans. Much of his later life was spent working for the anti-slavery movement, and his autobiography played a significant role in furthering the abolitionist cause.